There is one look we are crazy about for autumn, bronze. We quite liked the metallics over the summer, but the warmer tone of bronze just makes us happy inside. 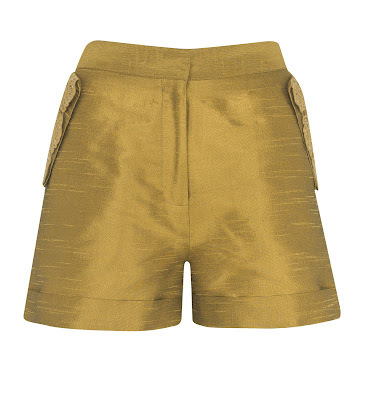 In particular, we love Phillip Lim 3.1's collection, complete with this gorgeous bronze short-suit above. Tailoring is incredible, as is the price. However, having popped down to the Monsoon press day (how good are these guys these days!?) we spied this amazing pair of shorts below. At £42 they tick every box including the 'if we don't buy some bronze we're going to pass out' one. Team them up with a plain tee and simple heels and you've got a lovely drinks and dinner outfit. We're wearing ours (in our heads at the moment, they get instore early August) with our navy Zara jacket, silk cream blouse and ASOS wedges. Bliss.